Like most common names, "Little Black Caddis" can refer to more than one taxon. They're previewed below, along with 1 specimen. For more detail click through to the scientific names. These are often called Little Black Caddisfly. 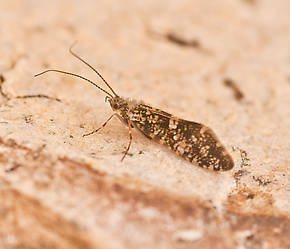 The sporadic emergence of these caddisflies diminishes the importance of the freshly emerged adults and pupae, but they have unique periods of vulnerability as larvae during the day and again as diving egg layers at dusk that can make them very important. A taxon can only have one common name attached in the title but this is one of those genera whose species come in a variety of colors and descriptive common names. In the West their bodies generally come in tan to brown shades with matching wings, their wings can be speckled grayish tan or even almost black as with an eastern species. Some western rivers have astounding populations. See Glossosomatidae for more information. These are sometimes called Little Black Caddisfly. Gary LaFontaine tells the story in Caddisflies of how this species came to awareness through rumors of a widespread, intense hatch of an undentified brown and green caddisfly throughout the West. He traveled across the West collecting these flies and determined that they were Brachycentrus occidentalis. These are very rarely called Little Black Caddisfly. This is a smaller, darker cousin of Brachycentrus numerosus.